Therapeutic Taping, also known as Kinesiology Taping, is a method of treatment offered by the physical therapists at Elite Spine and Sports Care of Totowa. The therapeutic taping process is simple – it involves a special tape placed along your body to ease muscle tenseness, improve movement and support your joints. Unlike athletic tape, kinesiology tape promotes movement rather than restricting! This additional movement helps to improve circulation promoting healing, pain relief and more. 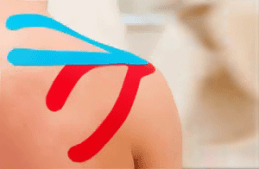 How Does Therapeutic Taping Work? On the surface, Kinesiology tape is simply pulling at the outer epidermis. However, it is much more than just surface effects! As the tape pulls on the outer skin, the muscles and tissue below begin to have increased blood flow or circulation. This helps to decrease pain and muscle spasms. This increased blood flow creates balance in the neural circuitry within tissues, muscles, and joints. Lastly, this tape has been seen as a useful tool in the realignment of joint positions after injury.